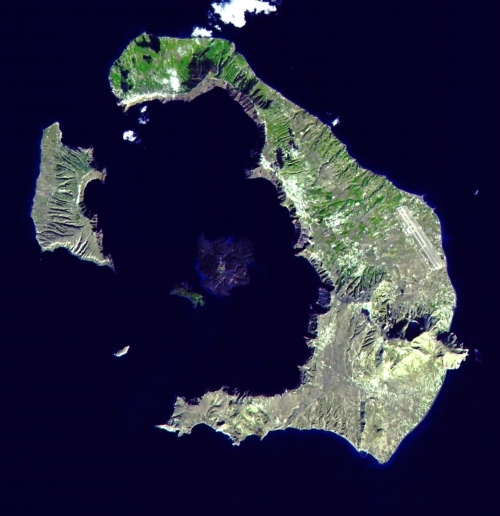 This satellite view of Santorini was published by NASA. It was taken on 21 November 2000 by the Advanced Spaceborne Thermal Emission and Reflection Radiometer (ASTER), part of NASA's Terra spacecraft. The island of Santorini was once approximately round, and during a series of caldera explosions the central part of the island disappeared. The most recent one of these explosions, sometime around 1600 BC, is thought to have formed the upper third of the present-day caldera. The resulting tsunami is thought to have devastated the Minoan civilization on Crete. Interestingly, the excavations on Santorini show that the citizens there had substantial warning of the coming calamity as they left very little behind during their exodus. More information on the geological history of Santorini can be found at decadevolcano.net.